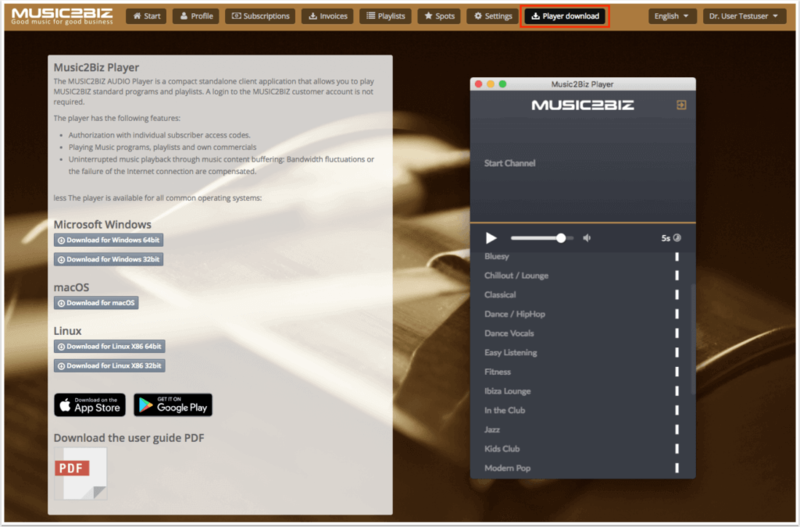 Navigation to the customer account www.music2biz.com | Click on “Login” in the top navigation bar. 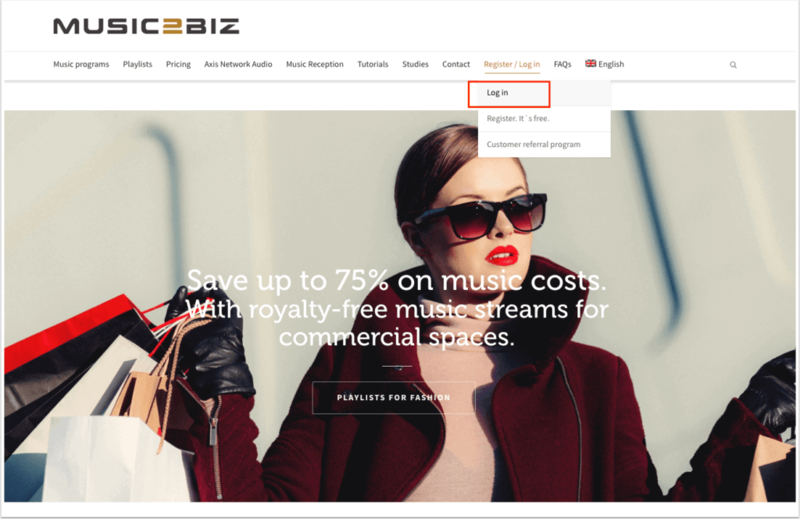 Enter your MUSIC2BIZ customer access data. 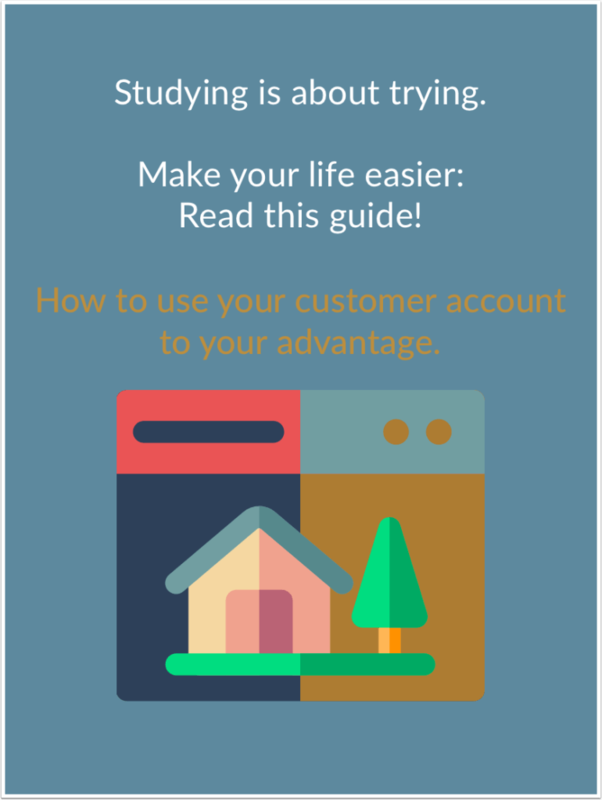 After successful login, the start page of your customer account opens. 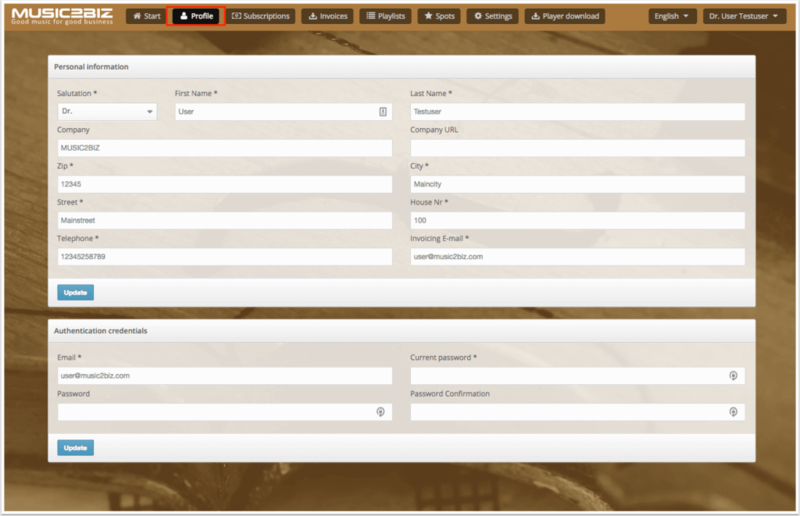 With the upper navigation menu you can visit the different areas of the customer account. 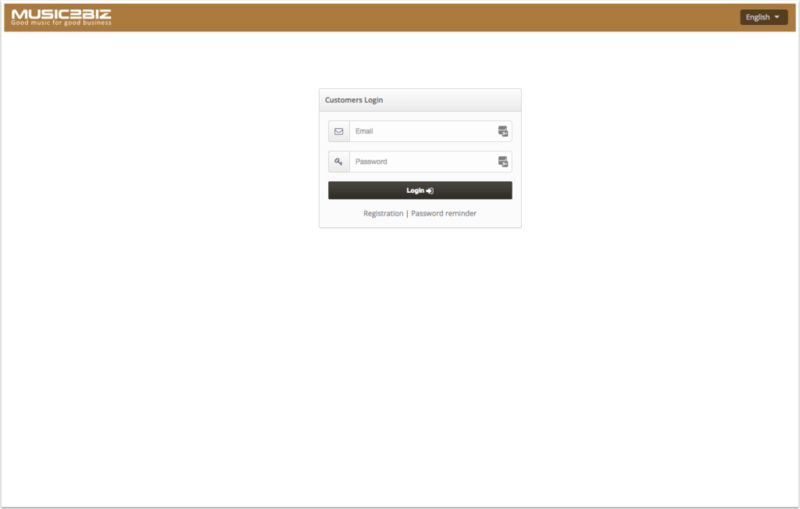 1) Start: The start page, this is the page shown here, which you are currently viewing as a screenshot. 2) Profile: Here you enter or update your customer data. 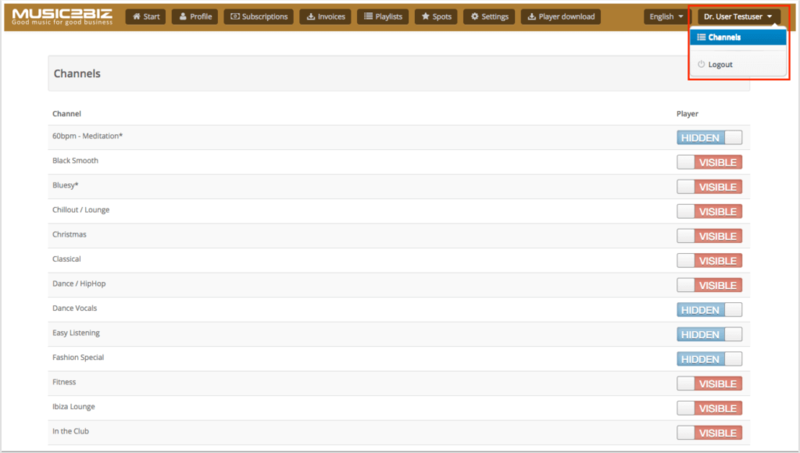 3) Subscriptions: Here you manage the number of your subscribed music flatrates. 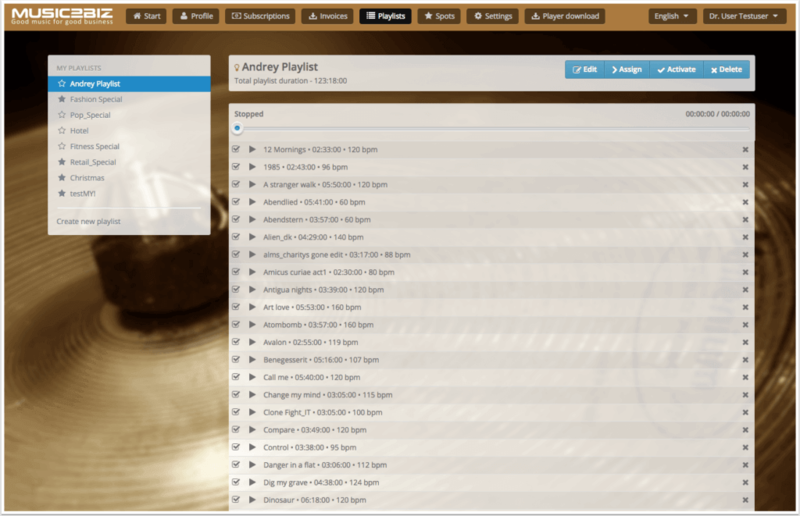 5) Playlists: By creating your own playlists, you can design your MUSIC2BIZ program even more individually. 6) Spots: With this function you can upload your own advertising spots and plan and play them to the minute. 7) Settings: During the trial period, you can cancel your trial subscription here at any time by clicking on the button. 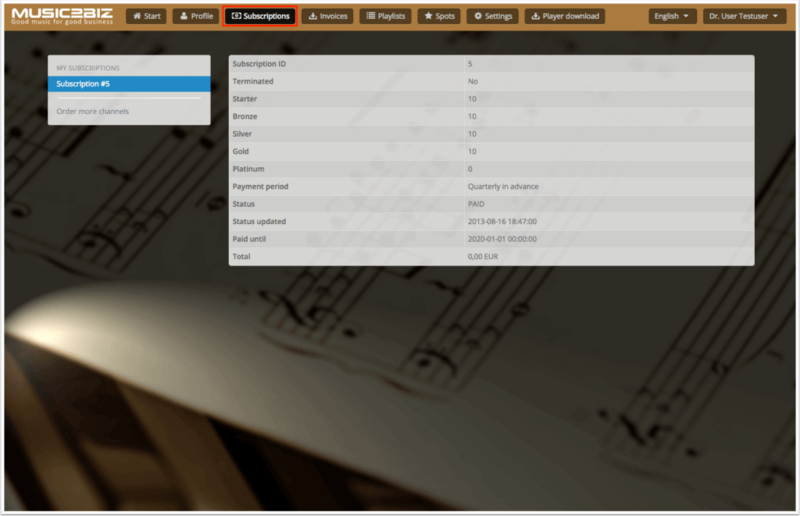 8) Download the player: The free MUSIC2BIZ Software.Player stores 2 hours of music in case the internet should fail. 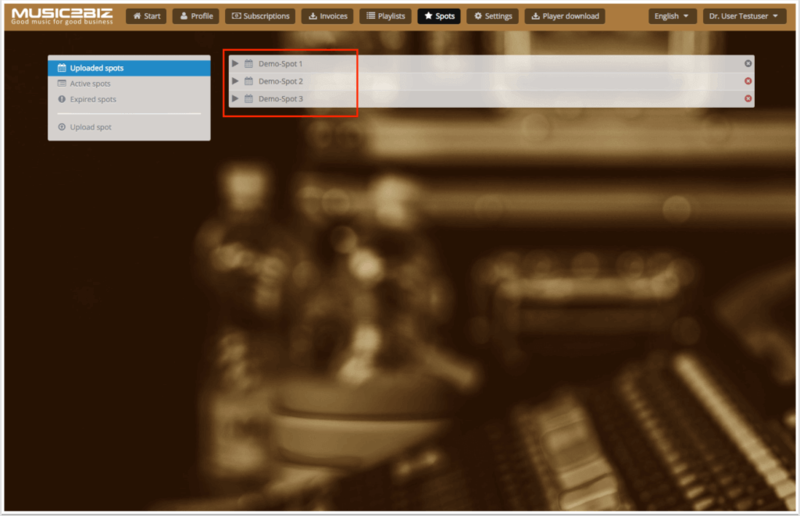 11) Click on a music program button. 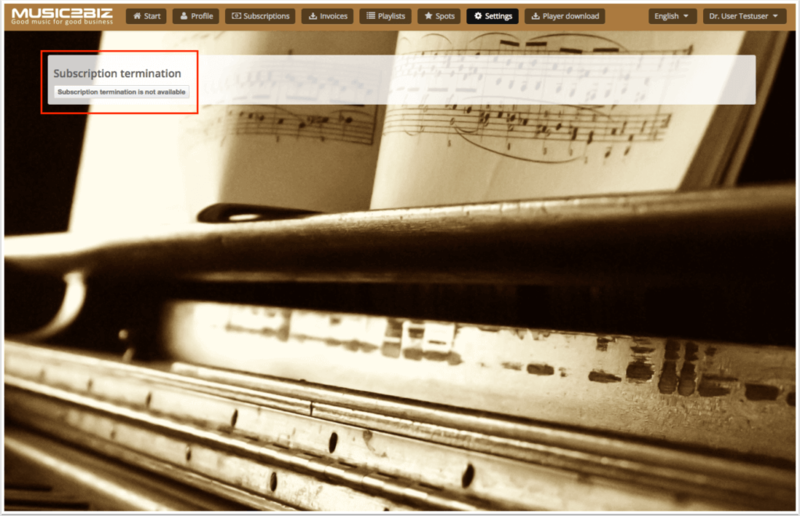 A subpage for selecting a music program will open. The direct links to the respective music programs can be stored in Internet radio stations as radio stations. In the backend for Sonos speakers, these MUSIC2BIZ streaming URLs can also be stored as separate radio stations. 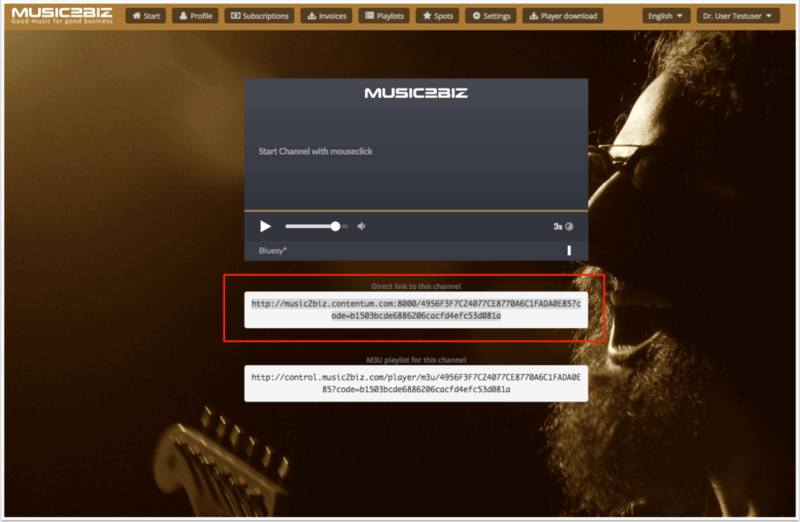 The direct links to the respective music programs can also be saved as radio stations for the streaming hardware players. Invoice and certificate archive: On this page you can download your invoices and your GEMA / AKM / SUISA exemption declaration as a PDF file. 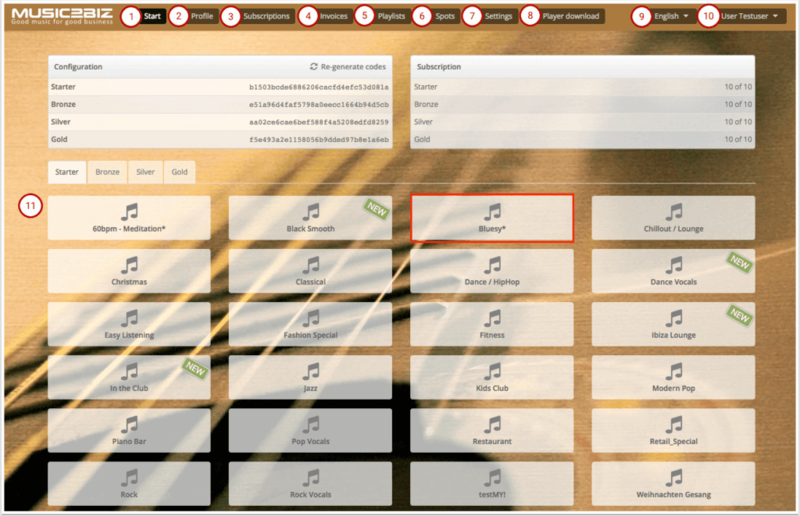 Our online tool “Playlists” allows you to create your own music programs free of charge based on our extensive music library. In this way, you can create very special music programs for individual business areas or for different locations or simply for different times of the day. 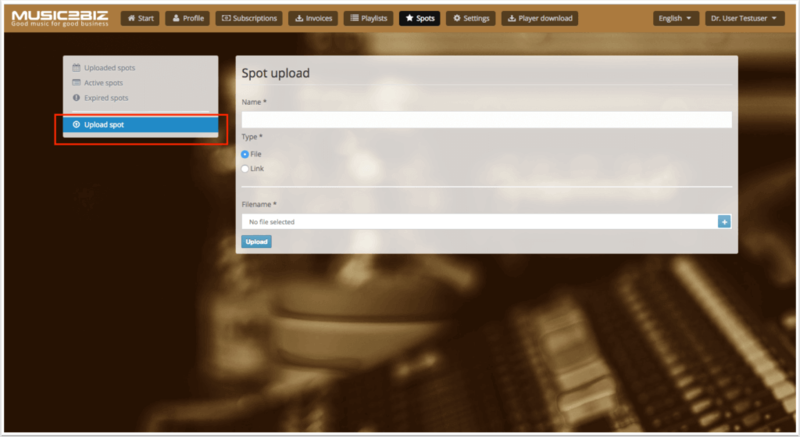 In addition, you can upload your own commercials and integrate them into your playlists (see also the navigation point “Spots”). You can quickly and easily upload your own advertising spots to your customer account using our “Spots” tool. You can also use our spot tool to plan the insertion of your spots to the minute. 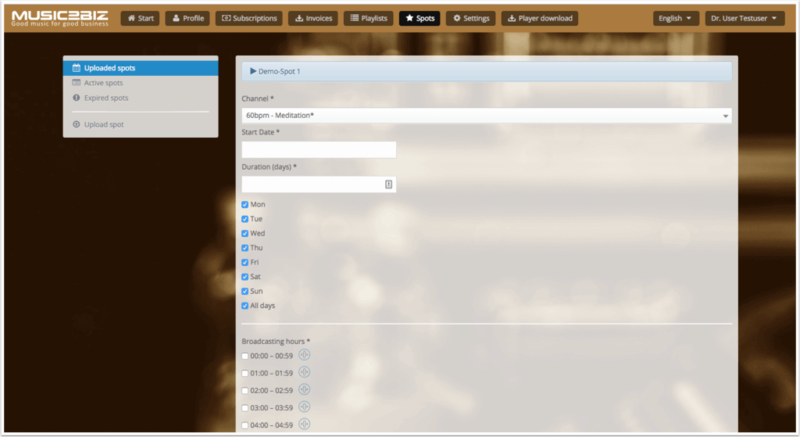 You can plan the broadcast times of your own commercials to the minute here. Your uploaded advertising spots are made available to you as an archive. You can activate and deactivate your spots as you wish. During the free trial period you can cancel your subscription at any time by simply clicking on the Cancel button. After the free trial period has expired, you can only cancel your subscription by email or post. 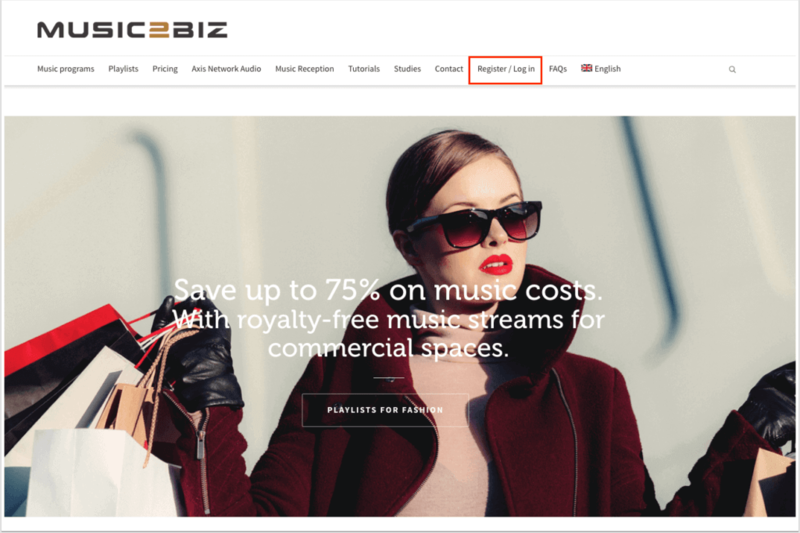 The MUSIC2BIZ App is free for customers. It is available as desktop version or as mobile player. The app can be downloaded from the customer account or from the App Stores of Apple (IOS) and Google (Android).